Generation X, Y, Z, the increasing heterogeneity of the employees in terms of their age structure, biographies and related lifestyles is changing companies increasingly. Globally distributed and flexible jobs in the home office or at work, as well as new, mostly digital ways and work methods have an effect on working (together), communication and work culture. Fittingly, Dr. Nadja Well, Vice President of Consulting & Implementation at TecAlliance GmbH, the leading European service provider for automotive information systems and software in the aftermarket and umbrella brand for TecDoc, TecCom and TecRMI, talked about her experiences at the 79th Round Table of Münchner UnternehmerKreis IT on October 15, 2015. How can and must the management of employees be organised given this mix of “old” and “young”, traditional and modern, analogue and digital? What are the challenges that companies and managers face when it comes to reconciling this wide range both strategically and operationally as well as globally and locally, while always taking into account the employees’ work-life balance? Following the motto “Fortune favour the courageous”, Dr Well provided the right answers and lectures on the topic of “Management in times of cultural and technological change”. “Take the bull by the horns and let the generations interact with each other. Have the courage rethink management and practise it in a new way. Approach the already mentioned heterogeneity with clarity in terms of guidance as well as creative and human diversity in terms of management!” demands Well, who restructured and reorganised almost the entire team of TecAlliance consultants in ten months. 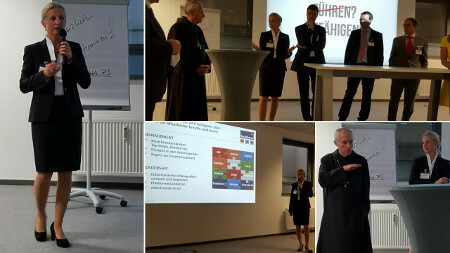 Münchner UnternehmerKreis IT (MUK) is an initiative of Munich IT entrepreneurs, who created a platform for the holistic and exclusive exchange of information and experiences after the 2001 stock market crash. Currently, over 700 IT entrepreneurs use this platform for an exclusive exchange of information and experiences. The initiative seeks to explore similarities, inspire contributors and establish and maintain an open form of exchanging expertise. The primary goals of MUK are organising cooperative projects in support of growth, promoting dialogue between IT companies and Munich universities and the active exchange of best practices.